, giving you greater control over who can edit or view specific pages on your Google Site. This is welcome news for me. As a student at UCLA, I participated in the university’s Undergraduate Student Initiated Education program, which allows undergraduates to step into a professor’s shoes for a quarter and lead a discussion seminar of their own design. Being on the teaching side of education for the first time, I discovered that I needed a way to quickly organize my classroom assignments, lecture notes, and other resources, while allowing my students to easily submit weekly responses and contribute academic insights. I can organize all of my personal research in one section, making it visible only to me. Then, I can grant each student a private page that only he or she can edit, to house class journals or longer response essays, and I can set up a separate section where everyone can contribute articles they’ve found interesting. With comments, videos, and gadgets, any of these pages can easily become an interactive springboard for next week’s discussion. After the class wraps up and I’ve put the finishing touches on my homepage, I’m ready to present my Site to my faculty mentor. 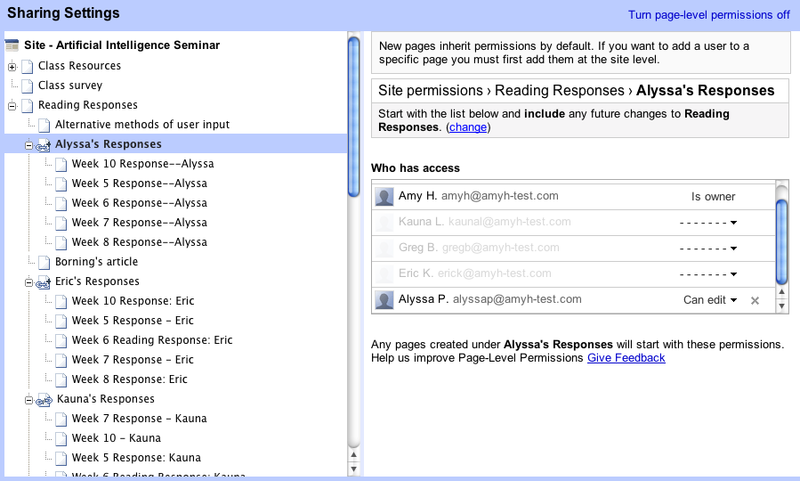 This fall, whether you’ll be a student organizing a group project, an educator preparing for a class, or anywhere in between, page-level permissions gives you the power to control who sees and edits what on your Google Site. For more information, check out our getting started guide. Today, we launched page-level permissions for Sites, giving you greater control over who can edit or view specific pages on your Google Site. Very helpful! We're using Google Sites for our student organization's website, and it's growing quickly! 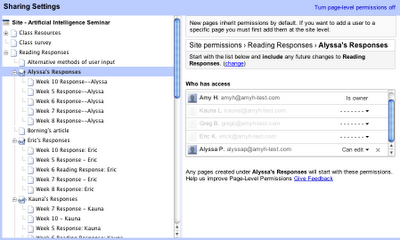 We're getting to the point where page permissions will come in very handy!